Diesel is not a word you hear often in Canada, apart from the denim fashion icon. In terms of cars, diesel engines were always under the impression of having a foul smell, being burdened with cold starts in the winter, and emitting tractor-like exhaust noises. Hence, Canadians most often opt for a gasoline engine that offers a quieter exhaust, gives more horsepower than a diesel, and is found at every Canadian gas station, while diesel isn't. Fly yourself over to Europe and you will see the polar opposite. Nearly 50% of the cars there have diesel engines. So what makes a diesel so attractive? It's the outrageous amount of low-end torque and phenomenal fuel economy. Sure sounds like a compelling reason to get one, and we aren't complaning about making less stops for fuel either. At Canadian Auto Review, we are lucky enough to drive plenty of new vehicles each year, but only once in a blue moon do we receive a diesel test vehicle. So you could imagine our delighted faces when we heard BMW Canada had a new 2014 BMW 535d xDrive available. We booked it for a week to see if a diesel engine is really worth the extra money. 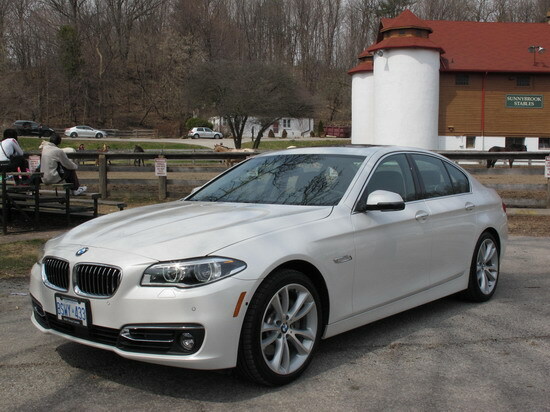 The 2014 BMW 535d xDrive starts at $68,150, and is $1500 more than the gasoline counterpart, the 535i xDrive. The 535d comes equipped with a twin-scroll turbocharged straight-six that produces a staggering 413 lb-ft of torque. That's 113 lb-ft more than the 535i. This 4255-pound car gets rocket launched from 0-60mph in 5.7s, and that xDrive all-wheel-drive system (no rear-wheel-drive option for us Canadians) makes sure the four wheels stay planted on the tarmac. Realistically, torque is all you need when you're driving in the city. Red light sprints, overtakes, and low-speed acceleration. Sure, you aren't able to rev the engine to 7000 rpm, but how often do we redline anyways? This thing darts like its got launch control. The tradeoff with the diesel however is less horsepower, 45 less than the 535i to be exact. This means limited revs, poorer high-speed performance, and less pull through each of the eight gears. Might I add, the 535d also emits an underwhelming exhaust note. Though, the diesel noise isn't as apparent as the 2014 BMW 328d xDrive we drove a few weeks ago, and that thing sounded like a truck. Surprisingly, stick the 535d into sport mode, build up some revs, and the exhaust note actually sounds quite decent. The only times you might blush and cringe is when hitting the ignition button and when cruising at low speeds. The 535d comes standard with the bread and butter 8-speed ZF automatic transmission that performs flawlessly with its silky smooth gear changes. The soft suspension makes for a delightful ride and a worthy long distance cruiser, and though the steering is lighter than I'd prefer, it does a great job lugging around this heavy sedan. As with every BMW there are four adaptive modes to choose from, ECO PRO, COMFORT, SPORT, and SPORT+. I won't go into details about each one, but here's a little tip. If you have ever driven a BMW, you might notice that in SPORT mode, when accelerating close to the red-line, the computers will automatically up-shift for you. If you want total control of your gear changes without the computers intervening, switch it to SPORT+ mode. This setting truly lets you red-line and squeeze out every ounce of horsepower without those pesky automatic up-shifts and down-shifts. In addition to the bountiful supply of low-end torque, another attractive feature of the diesel-powered 535d is its fuel economy. While BMW estimates an averaged fuel consumption rating of 6.7 L/100km, we managed an average of 8.6 L/100km, which is still not bad for a six-cylinder engine with this much power and weight. Truth be told, we weren't exactly driving economically either. We spent most of the time in sport mode enjoying the instantaneous Saturn V diesel thrusts. Can you blame us? The steering is just so much sharper in this mode as well. Drive like a normal person and you will probably end up in close proximity with the BMW estimates. The styling of the BMW 5-series really took some getting used to, though I will admit it has finally grown on me and is partly due to the new Active LED headlights, part of the $4500 Technology Package. Those glaring eyes look devilishly good in the dark, and probably cost a fortune to replace. The 535d strikes us with a sophisticated stature that showcases its conservative lines, and with an M-sport package slapped on for another $3600, it's even prettier. Housed in the rear is a single twin-pipe exhaust, similar to the 528i. Note that the 535i gets two single exhausts pipes, one on each side. It's a helpful method of differentiation without having to peer at their badges. Our test vehicle is doused in the Mineral White Metallic paint, which gives a subtle shimmer and is glossier than the standard Alpine White paint. While nearly every car in Markham, Ontario is white, this 535d will fit right in. 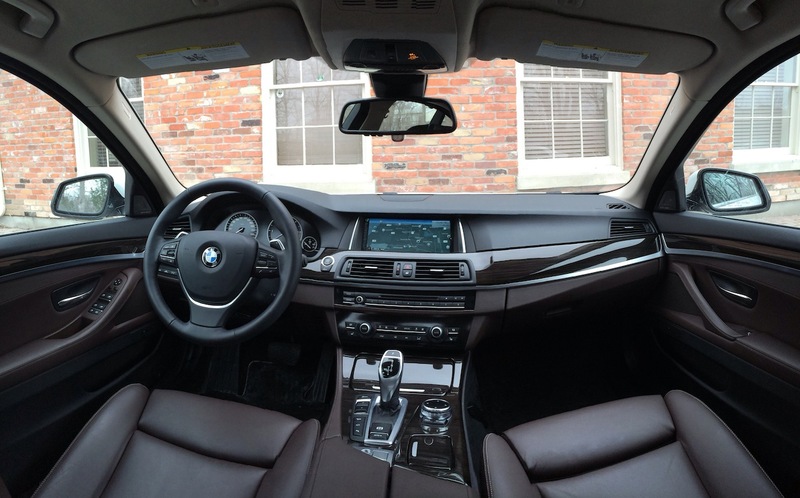 Everything about the 535d interior screams top-notch quality, especially when you compare it to a 3-series. All the buttons give more tactile feedback, the iDrive screen is bigger, and the seatbelts give a tight hug when the doors lock. The seats are ten times more plush thanks to the $1500 Comfort Seat option, which adds a pair of meticulously stitched Mocha Nappa Leather seats that have an adjustable head-rest, just like they have on airplanes. My goodness, once you have sat in one of these seats, you won't want to lay your bum on that leatherette rubbish anymore. Take my money BMW. We've got copious amounts of legroom at the front and rear seats, both are heated as well. The rear seats surprisingly lack any climate control buttons, and in a mid-size sedan in this price range, it is something we'd expect. One aspect of a car's interior that matters most to me is the look and feel of the steering wheel. The beloved M-sport steering wheel from our 335i GT test vehicle last week was wrapped with the softest leather and fitted my hands like a custom glove, while the 535d wheel feels rather large and overweighted in comparison. The heated steering wheel is also slow to warm up, and the heat isn't well distributed all around the wheel. The warmth is mostly felt on the 9:00 and 3:00 positions. On the plus side, it has still got easy access buttons within a thumb's reach, and quality-built paddle shifters mounted on the back. We also got the thumping Harmon Kardon speakers that are part of the $4200 Premium Package, and 3-series owners might note that the 5's speakers are much smaller in size. For those audiophiles out there with $4900 to spare, the Bang & Olufsen option with its rising center speaker won't disappoint as well. The $4500 Technology Package includes a heads-up display that is one of the best in the industry. What impressed us was the display's adjustability, useful for anyone that sits a bit lower or higher. With the iDrive controls, you can set the height of the display, and also its rotation around an axis. Many heads-up displays like the one in the 2014 Mazda3 punishes you for sitting too high or too low - you won't even be able to see the display. Our test vehicle was also fitted with a $2500 stand alone option ($1900 when paired with the Technology package) known as Driving Assistant. It's a nifty function that keeps you at a constant distance from the vehicle in front of you. Set a speed and distance with the steering wheel controls, and off you go. When the vehicle in front begins to slow down, the 535d will automatically apply the brakes and maintain that selected distance. When the vehicle in front begins to accelerate, so will you. All this without touching a pedal or a button. Note that to move off again after the 535d has stopped, the driver has to give the command to accelerate manually by briefly pressing the gas pedal or with the scroll button on the steering wheel. As with every BMW, I am learning something new with this Comfort Access option. Kicking your foot under the bumper not only opens the trunk door, but can close it too. I've been reaching up with heavy bags to try and hit that close button on the trunk door, only to "accidentally" kick my foot under the rear bumper and have it close by itself. Hopefully after reading this review, you will realize why we love the 2014 BMW 535d xDrive. Great passing power, outstanding fuel economy, and with no compromises to the interior and exterior quality fit and finish. Of course, diesels don't come without a few caveats - the underwhelming exhaust noise and lack of horsepower revving fun, but these aspects are mainly superficial and not everyone's imperative. When it comes down to everyday driving, that extra torque makes a huge difference, and when you reach out to pay for fuel at the pump, you will be laughing at those gasoline car owners paying for 91-octane premium gas (diesel only has one grade). We need more diesels like the BMW 535d in Canada, and with today's fuel prices up to 139.9 cents/litre, hybrids and diesels sure seem like the right path to go.